Dopplr, a social network for frequent travellers, has raised early stage funding from Martin Varsavsky, Joi Ito, Reid Hoffman and Saul Klein’s Accelerator Group. Dopplr allows users to share future travel plans with fellow travellers they have chosen to link up with. When you plan a trip, it reminds you of contacts that will be in the place you plan to visit. The site was launched earlier this year and is operated by Dopplr Ltd, a company based in Helsinki. Founders include Matt Jones and Matt Biddulph, who have previously worked on web projects for the BBC. The site is nice and focused, and is simple to use – ideal if you and your friends/colleagues travel a lot and want to keep up with each other’s trips. It runs on Ruby on Rails, and also makes good use of Google Maps to display destinations. It already has a Facebook application in the works, and has just released an API. While the site has no obvious way of making money at the moment, it will have an extremely targeted audience that would appeal to advertisers. It is currently in private beta - you need to be invited by a fellow traveller at the moment. 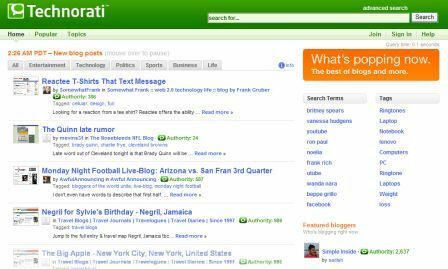 Technorati has released another update of its homepage, shifting the site’s emphasis back towards blogs, rather than videos, music and podcasts. HSBC has responded to a Facebook-based campaign against its charges for graduates – another sign that social networking sites have become a hotbed of consumer activity and that big brands are listening. Following the protests, the bank said it would reverse its decision to abolish interest-free overdrafts for students leaving university this summer and would refund charges they have already paid. Nielsen/NetRatings’ August stats for social network use in the US show continued growth for Facebook and business network LinkedIn. Facebook increased its number of unique users by 117% year-on-year to reach 19.1m, while business social network LinkedIn had 4.4m, up 163%.